We provide our rug cleaning and repair services to customers in the Worcester County area, including the town of Sudbury MA; Sudbury, is only about a 30 minute drive, making pickups and deliveries quick and easy! Did we mention that we provide free pickup and delivery services to our customers in Sudbury MA, and other towns and cities around the Worcester County area? Well, we do! 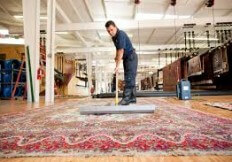 Our cleaning services will help extend the life and beauty of your Oriental Rug. Our services go far beyond the surface, and infiltrate particles embedded deep inside the rug’s fabrics. We also offer repair and restoration services for Sudbury MA oriental rug owners; we repair fringes and worn edges. If you’re in the Sudbury MA area, and you’re interested in our rug cleaning or repair services, please give Persia Oriental Rug Gallery a call at 508-753-4667.